I never thought I would be able to write about macarons. As much as I enjoy dessert at the end of meals and the occasional sweet as a snack, I don’t think of myself as a confections connoisseur. However with my cousin in town, She Clooney (SC or Clooney for short), I couldn’t pass up the opportunity. She has the nickname she does because she reminds me of George Clooney’s character in the 2009 film, “Up in the Air”. She literally is on a plane commuting every week mostly for work, traveling all over the USA and sometimes abroad. Clooney is as passionate about food as I am, but even more knowledgeable as she has a more refined palate for sweets, in particular macarons. Every city she visits, she seeks out these round rainbow coloured confections. SC has even eaten them from Laudrée in Paris. She loves them so much that they featured prominently on her wedding cake. This rumble will feature Soirette, Thierry and the newly opened Faubourg Paris on Hornby Street. All 3 shops were visited within a 5 day span. Unfortunately we were not able to buy the exact flavours from all the locations; we tried when they were available. This quaint and airy shop was full of whimsy. She Clooney love the brightly painted patio furniture outside of the store and was further impressed with the variety and uniquiness of the flavours offered by Soirrette. The staff answered all our questions about their unique flavours like Salted Truffle, Charred Corn, Rocher and Fleur de Lys. The texture of all the macarons were on point; it had thin crisp crust that didn’t easily crack and had a slight chew. We were really impressed with the Raspberry as they use both a creamy filling and thin layer of jam, which made the flavour more complex and interesting. The salted trufle was fantastic. The truffle taste was bold and enhanced by the large salt crystals on top of the macaron. The taste lingered somewhat. The girl at the counter recommended we leave the salted truffle macaron until the end and we’ve glad we did as it would wrecked our palate for the other flavours if we had eaten it first. Lastly we like the plastic holders found within the box (ensuring Soirette’s macarons didn’t slide around). The dark wood and décor of Thierry reflects the decadency of the confections found within the shop. It was very busy considering it was 9pm on weekday, when SC and I arrived. Despite having 12 flavours listed on its website, only 4 flavours were available to purchase. Thierry’s macarons were much larger than the ones at Soirette. The macaron had the right crispy exterior but was denser and chewier than Soirette. Clooney speculated that its larger size may have contributed to the moister interior. She also noted that the texture exhibited by these macaron were very similar to Laudrée’s macarons she had in Paris. Clooney had low expectations for the Cassis (also known as black currents) macaron, but was thoroughly impressed with the flavour, as was I. Thierry’s used a combination of cream and jam filling (much like Soirette’s raspberry) gave the macaron’s flavour more depth. The jam in the centre was a touch tart which helped enhance and balance the flavour of the macaron, making this offering a huge hit. Unfortunately She Clooney had to jet back to Denver for work. However after having two tastings with her and absorbing all the insights SC shared, I felt confident I could complete the rumble. Entering the newly opened Faubourg location across from the Art Gallery after work, the shop was really going for the Palace of Versailles look. I was happy to see they were many varieties of macarons for me to choose from. 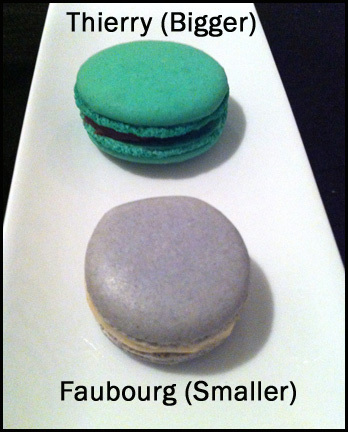 The macarons at Faubourg are smaller than Thierry’s and are on par with Soirette. Out of the 3 shops, Faubourg was the most consistent in terms of their flavours as everything tasted as described. However none of the flavours really stood out either. When I grabbed a few of the macarons out of the Faubourg box, they cracked badly. Since I was home, I sliced a few in half and saw a pocket of air underneath the crust, which is probably why they cracked so easily when handled. Faubroug’s renditions were very dry and crumbly. They did not have a chewiness at all. These macarons were not prepared as well as the other 2 rumble participants. 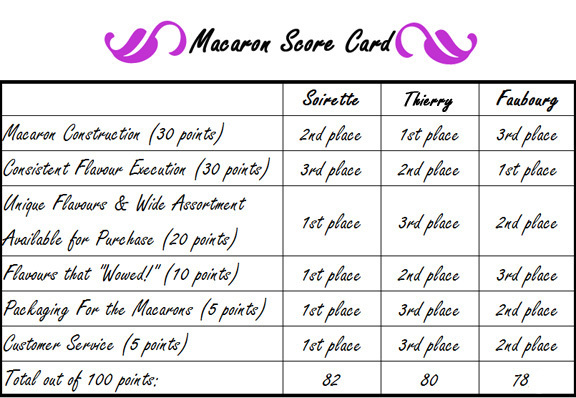 As you can see it was very close but the winner of the Downtown Macaron Rumble is SOIRETTE! 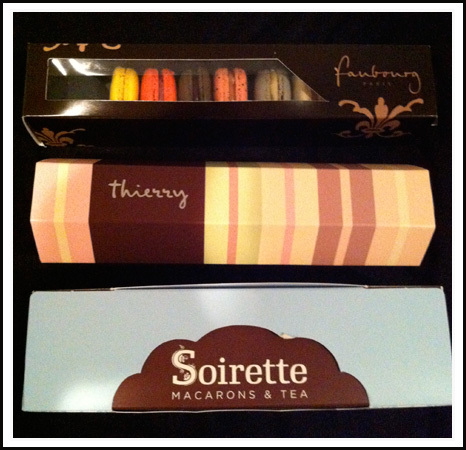 I had a gut feeling after we visited Soirette and consumed its macarons, that they may come out on top. When you dine out or eat an item a lot, it becomes harder to be impressed with something simply because of the wealth of experience you acquire. So when I saw how She Clooney, a veteran macaron eater, was so enthusiastic (almost giddy) about the macarons available at Soirette, instinctually I felt we may have stumbled on something special. In the end, it was the attention to detail and creativity that put Soirette ahead of the rest of the competitors. The well trained and friendly staff who patiently answered all our questions and the snazzy plastic holder in the box demonstrated a thoughtfulness. I appreciate the risk taken by the owners in creating such a wide range of novel and “out of the box” flavours. I rather reward someone for trying new ideas and thereby creating something outstanding than someone who plays it safe and sticks to common flavours.